How to integrate it with your existing web marketing and analytics stack. 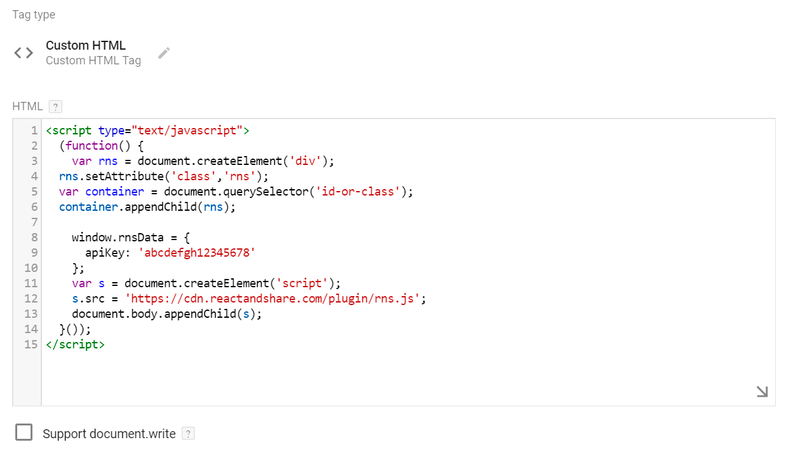 There are three ways to install React & Share on any content management system. Place this snippet exactly where you want the plugin to be shown. Make sure to replace abcdefgh12345678 with your API key. You can place the embed code to your page templates on any content management system. Here's how it works. apiKey yes String API Key that was created upon the registration. canonicalUrl no String Canonical url of the page or post. By default the plugin uses the value of <link ref="canonical"> element. The default value can be overdriven by this property. If no link element or property is not provided, the url of the page is used instead. To make the analytics dashboard more useful, you can embed more metadata. 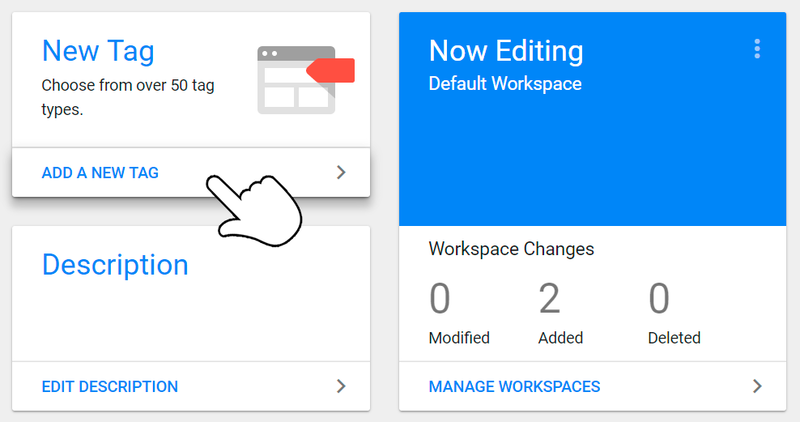 Google Tag Manager installation works the same as using the embed code, with one caveat: you'll have to manually specify where the buttons will be shown. The buttons will be embedded to the bottom of the element you specify. Check the id or the class of the div element and place it inside the querySelector. Type .class if you're using a class, or #id if using an id. 2. 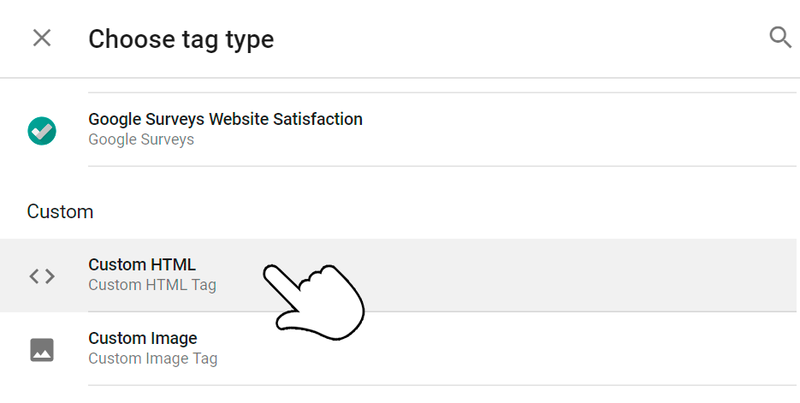 Log in to your Google Tag Manager account and click "Add new tag"
4. From the "Choose tag type" menu, select "Custom HTML"
Make sure to replace abcdefgh12345678 with your API key and id-or-class with your element selector. You can also use your own custom triggers. Sometimes it's a good idea to limit the trigger to only some areas of the site. This guide works for most installations, but here's Google's full guide to triggers. 8. Click "Preview" or "Submit"
If you're feeling confident, you can click "Submit" and the reaction buttons should now be visible on your site. You can also click "Preview" and the changes will be visible only to you. Remember to click "Submit" when you want to publish the changes. Click save - that's it! You can change the visibility of reaction buttons from the plugin settings and individual content editing pages. Additional metadata can be embedded in the code as seen below. title no String Title of the page or post. Defaults to the value of Open Graph tag og:title if it exists. If neither Open Graph tag or title property exist, the title of the page is used instead. author no String Name of the author of the page or post. Defaults to value of Open Graph tag article:author if it exists. date no String or Number ISO-8601 date string or Unix timestamp Type in milliseconds. Defaults to the value of Open Graph tag article:published_time if it exists. tags no [String] Tag associated with the page or the post. commentNumber no Number Number of comments, if there is a possibility to leave comments on the page. Callback functions can be used to call 3rd party services for deeper integration into your marketing and analytics stack. This function can be used to access the existing plugin element, e.g. add elements to the plugin. url String Canonical url of the parent of the plugin or url of the page. Please notice that thirdPartyChat.open() is just an example and not a working piece of code. This function can be used e.g. to trigger 3rd party analytics or marketing automation services. reactionLabel String Label of the reaction button clicked.